On Aug. 20, Rep. Seth Grove (R-Dover) testified before the House Select Committee on Property Tax Reform regarding his House Bill 2230, a proposal which would allow for voters, through referendum, to increase the countywide sales tax to offset property taxes, and would permit local governments to increase income taxes in exchange for dollar for dollar millage rate reductions. Grove is a proponent of property tax reform that includes tax diversification, local governments retaining control of taxes and spending, and voters having a voice in the process. 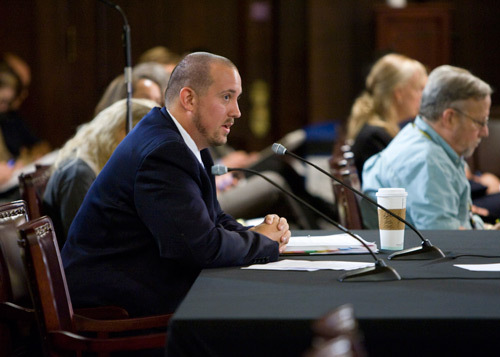 HARRISBURG – Rep. Seth Grove (R-Dover) today testified before the House Select Committee on Property Tax Reform to advocate for local tax diversification and addressing the background issues plaguing homeowners when it comes to funding public education and local government. The House Select Committee on Property Taxes was formed with the adoption of House Resolution 774 to study property tax alternatives. It will report its findings and recommendations to the House by Nov. 30. Also testifying before the bi-partisan committee were Rep. David Maloney (R-Berks) and Sen. David Argall (R-Schuylkill/Berks/Carbon/Lehigh/Monroe/Northampton). Grove spoke about his House Bill 2230, which would institute countywide referendums across the state, excluding Philadelphia County, to allow voters to implement a 1 percent county sales tax, with the proceeds reducing school district millage rates within the county. It also would allow local taxing authorities to levy either an Earned Income Tax (EIT) or a Personal Income Tax (PIT) to reduce property taxes by 30 percent to 100 percent. Those doing so would see property taxes frozen at current levels. Grove also testified regarding his reservations about any statewide property tax shift plan. During his portion of the hearing, the committee also discussed with Grove the need to address the reassessment process and reducing the cost to operate local governments. Some counties in the Commonwealth have not reassessed home values in decades, while others more frequently complete the process. This further exacerbates the property tax disparity throughout Pennsylvania. Grove noted any tax shift plan that does not reduce the cost of operating local governments through mandate relief would result in a continued trend of tax increases.